We at Brick Walker Tavern are preserving our historical integrity while giving the community an opportunity to share in its grandeur. We provide a unique facility for lodging and your next special event in the beautiful Irish Hills! Wedding packages in Our Beautiful Barn or Banquet Room now available! The Devils Lake Inn is a one of a kind guest house. It has all the high tech and luxury conveniences the well-traveled visitor has come to expects It's unique themed suites provide the Instagram moment you want to share with family and friends and the quaint Manitou Beach village allows you the opportunity of escaping all the stress and traffic of the city. Great fun and relaxation await you at Hideaway Cove! Fishing, Swimming, Boating and a very relaxing time is what you can expect when you stay at Hideaway Cove. We have five cabins furnished and equipped with everything you will need for a short, or long stay with us. Hideaway Cove is located on Evans Lake in Tipton Michigan. We have 100' of beach at your disposal for tanning or playtime. We have rowboat and a paddleboat at your disposal, and if you want to really get out on the lake, you can rent our pontoon boat. Irish Hills Resorts would like to offer you an experience that can't be found anywhere else. Whether you are vacationing with friends and family or planning a special event, our professionals will be sure to make it one to remember. All properties are located on US-12, in the heart of the Irish Hills Entertainment District. Please visit our website for details on all of our great resorts. Sauk Valley Resort is located in the beautiful Irish Hills of Brooklyn, Michigan. With our banquet facilities and scenic Michigan camping & lodging, this is an ideal setting for group gatherings, special events, and much more! We are also located approximately one mile from the Michigan International Speedway. The Cowboy Creek Lodge is a 15 room bunkhouse that sleeps groups of up to 40 people. You won’t find anything like this, around with 12 bedrooms, each having an in-house bathroom, television with satellite and private entrance, a large community room that includes sitting areas complete with television, bar area and Wi-Fi, a Jacuzzi room, equipped with sitting area, Wi-Fi and television, a fully equipped kitchen to prepare meals, bonfire pits, charcoal grills, and a large outdoor pavilion. The Trillium House "at Devils Lake"
Lovely early 1900's home located in downtown historic Manitou Beach. This beautiful home for weekly rental is within a block (walking distance) of downtown Manitou Beach which has boutiques, Manitou Beach restaurant, Coffee and ice cream shop plus the 2014 summer Saturday Farmers Market. This home has many pleasures for summer enjoyment. Camp O' the Hills Girl Scouts-Irish Hills - Located between Lena wee and Jackson County in the Irish Hills area, three lakes border Camp O' the Hills, with a beach on Wamplers' Lake and 109 beautiful acres of rolling hills, valleys and woods. Camp O' the Hills is popular for day events, troop camping, community encampments and multi-day training events. Come camp with us in the beautiful Irish Hills of southern Michigan! Have a great camping experience in a beautiful wooded area (open areas are also available). We have so much to offer that you don't need to go anywhere else. Use our 40 acre fishing lake - swimming pool - paddle boat pond - playground - arcade/game room - modern bath and showers - hay rides - trains rides and much more! Enjoy our large grassy sites, nestled in beautiful rolling hills. We offer hospitality, security, quiet, clean, family camping. Your whole family will love our stocked fishing pond which is set in the woods with a nature trail leading to it. Onsite activities include horseshoes, a playground for the kids, a large grass volleyball court and a basketball hoop. We are located near all Irish Hills attractions as well as the Michigan International Speedway. Enjoy a relaxing ride or hike through the beautifully landscaped hills of “Hidden Lake Gardens” or a calming game of golf. Dine in some of the finest restaurants in the Irish Hills. Soak up some sun on your choice of the 50 spring fed lakes. In just minutes away you can boat, fish, swim or just lay on the beach. If you are up for some racing excitement then 6 miles west of us is Michigan International Speedway. We are conveniently located 1 hour from Detroit and the Henry Ford Museum. Also Lansing, Monroe and Toledo. We are half an hour from Cabela’s in Dundee, Adrian, Ann Arbor and Jackson. Summer Camp & Retreat - Judson Collins is a place where children, youth, and adults discover who they are in the context of God’s love, grow in their knowledge, awareness and reflection of that love, and respond to God’s call to serve their congregation, their community, and their world. Judson Collins offers Christian camps for children and youth in the summer months, and retreat facilities for youth and adult groups the remainder of the year. Over 200 rolling, wooded acres, Over 2,000 numbered campsites, Directly across from the Michigan Speedway, Easy entry/easy exit -- wide roads on grounds, Special area for Big Rigs, Motor Homes, Campers, 5th wheels, Tents welcome, Retail Store on site, Ice - wood - grocery - camper supply sales on site, Plentiful Potable Water Stations, Hot Shower facilities, Dump Stations, Clean Rest Room facilities. LOCATED ACROSS FROM THE MAIN GATE OF MICHIGAN SPEEDWAY. Camping & Summer Camp - Camp Killarney offers a variety of exciting resident summer camp programs for youth ages PK- 12th grade. All programs are carefully designed to meet the needs of your camper and our mission. We offer campers both traditional and choice activities. Daily programs offer a safe awesome outdoor experience with plenty of room to explore. Campers also enjoy our bunkhouse style cabins, dining hall, craft & nature cabin, sand volleyball court, activity pavilion, outdoor chapel, health center, shower house, archery range, beach/swim area, hiking trails, field sports area, superb staff, and more! 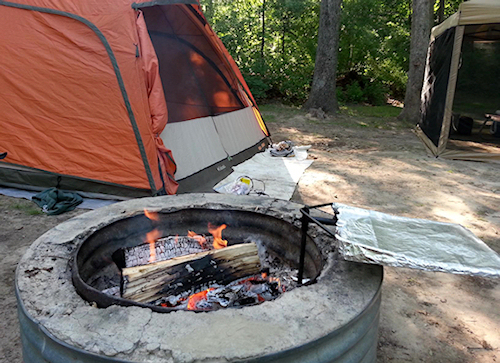 Camping at Michigan International Speedway has been a long-time tradition spanning more 40 years. RV, tents, pop-ups and motor coaches. We have a campsite for you! With nearly 9,000 campsites, MIS is the largest registered campground in the State of Michigan. So each year, thousands of campers arrive at MIS during NASCAR Sprint Cup Series events, spending the weekend camping out with their family and friends. Many of our campers leave with NEW friends! So join us for a camping vacation and make some memories that will last a lifetime. T.E.D. Ranch Campground is a family owned campgrounds, located on Phelps Lake. Just minutes from downtown Brooklyn, Michigan; 1/4 of a mile from the back entrance of MIS; and just a 9 minute drive to Vineyard Park on Vineyard Lake. Come swim, fish, boat and enjoy a relaxing get away on one of our 200 lots. Summer Camp & Retreat - Get your family together. Share a cabin and prepared meals. Explore the world and your relationships. Families that play together stay together at YMCA Storer Camps. Go for a horseback ride on one of our many trails, jump into our lake, climb our 100 foot rock-climbing tower, or fly down our zip line. Or, if your idea of a fun weekend is relaxation, you can spend your time hiking, napping and enjoying the quiet beauty of the Irish Hills. In the evenings, join in one of our night hikes, gaze through light years of stars, or end the day with campfire activities led by our friendly staff. Irish Hills offers enjoyment and beauty in EVERY season! visit the Brooklyn-Irish Hills Chamber of Commerce website or call (517) 592-8907. If you would like to receive future newsletters and other special notices, please sign up here. Experience the Irish Hills, Copyright © 2014, All rights reserved.